You must be a member of the Sydney City Trotters Group to attend this activity. Would you like to join this group? 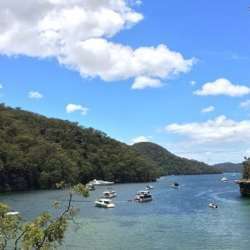 The relatively undiscovered Cowan to Jerusalem Bay track takes you through calm bushland ending up at a picturesque bay that is perfect for a swim and a picnic. Luckily we don’t have to hike 250km to see all the beautiful things that this part of New South Wales has to offer. Instead, we can simple do shorter sections. One of these sections is the 4km trail from the Cowan train station to Jerusalem Bay. It takes around 1 hour to get to the water and about 1.5 hours to get back to Cowan. Please note that while the track is short, it’s actually quite a difficult track with some very steep parts (especially at the beginning) and rough surfaces at times.